Orbit by Leigh Hellman is about Ciaan Gennett, who is known as a Halfsiee. She is a P-Kid who’s first mother is from Earth. She grew up having to defend herself, and ends up getting into a lot of trouble because of it. Thanks to her best friend, Tidoris, and a couple of new friends, Captain Mael (an Earther) and First Officer Nkoti (an artificial), she finds out about her past, and wishes she hadn’t. How far would a person go to become a mother? That is what Ciaan finds out. Leigh Hellman shows complex love relationships. Ciaan also finds out the truth about her second mother. She realizes that the truth isn’t always easy to hear or to understand. Thanks to monstrosities of the past, Ciaan finds her new future. 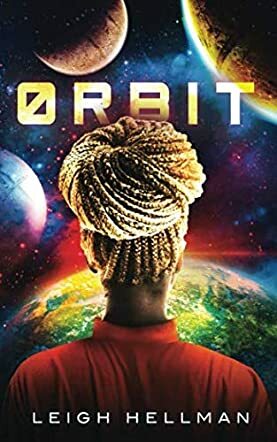 Orbit by Leigh Hellman is a fascinating read. It gave me a lot to think about. The idea of artificial people being used and treated like they are machines, aka AIs, is intriguing. I wondered what exactly makes us human, the way we are born or made? I liked how Leigh Hellman did her world building, literally and figuratively. She has built many worlds out of metal. I was a “misfit” growing up (still am), so it was nice to read about other “misfits” getting together and helping to save humanity, so to speak. I have to admit, Leigh Hellman’s Epilogue was a bit confusing. And there are still a lot of unanswered questions. I am hoping Leigh Hellman writes a sequel to help answer them. I did love the complex relationships; you still weren’t quite sure who ended up with whom and it was a nice twist.